IT’S BEYONCÉ’S WORLD, we just live in it. That’s the general consensus after the singer’s 16-minute display at last night’s MTV Video Music Awards. She performed a medley of hits from her latest album, and it was this moment that really has everyone talking. The track Superpower was represented as an instrumental segment played over the words and voice of Americanah author Chimamanda Ngozi Adichie’s Ted talk on feminism. They teach girls that they cannot be sexual beings in the way that boys are. They teach girls to shrink themselves, to make themselves smaller. We say to girls ‘you can have ambition, but not too much. You should aim to be successful, but not too successful, otherwise you will threaten the man’. Feminist, the person who believes in the social, political and economical equality of the sexes. @dailyedge Feminist? Beyonce?! Oh ffs... That word has lost all meaning. It breaks my heart when culture tells me that Beyonce is a feminist icon. 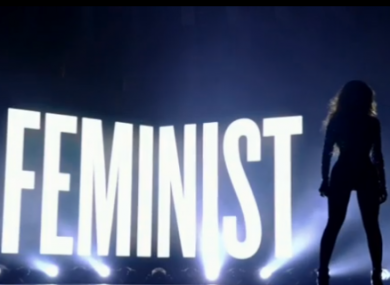 Email “Everybody's talking about Beyoncé's 'feminist' moment at the MTV awards ”. Feedback on “Everybody's talking about Beyoncé's 'feminist' moment at the MTV awards ”.